Here's my eighth gift for the Twelve Days of Christmas swap and one that will definitely try your patience! These beauties are completely covered with Dazzling Diamonds by placing a sheet of the multipurpose adhesive on a piece of cardstock and covering it with the glitter and then punching it out with the Blossom Petals Builder punch. 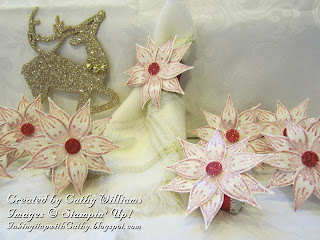 Each poinsettia has 10 petals that were then glued together with a red glitter center and placed onto rings made with the red glitter paper and the chunky silver glitter edging them. You must use a glue gun for this project. Oh, and have your husband laugh at you for having glitter all over your face! Start early if you have more than 8 at your Christmas table this year!